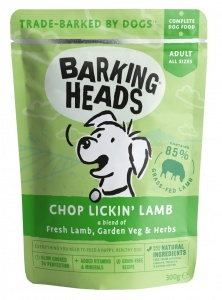 Delicious wet food with lamb from Barking Heads. This tasty recipe includes 85% lamb with great additions like sweet potato, spinach and courgettes. A gastronomic delight! These moist foods can be used as a complete diet, or as a 'topper' for dry foods to make them more appetising. 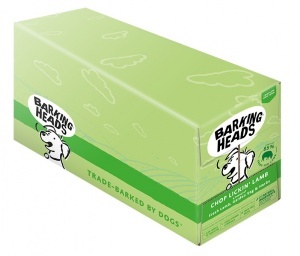 As usual with Barking Heads, these healthy dog foods contain no artificial colours or preservatives, and all the ingredients are fully traceable with no GM products. 85% Chicken (includes 60% Chicken; 25% Chicken Broth); Sweet Potato; Spinach; Courgette; Peas; Sunflower Oil; Salmon Oil; Seaweed; Lucerne; Parsley; Turmeric; Aniseed; Mint; Fenugreek; Minerals. Protein 10%; Fat 6%; Crude ash 2%; Crude fiber 0.6%; Moisture 79%.